One year after the infamous June 4, 2017 far-right rally held by Joey Gibson, he and his group Patriot Prayer plan a return to Terry Schrunk Plaza in downtown Portland with a rally scheduled for June 3rd, 2018. The 2017 rally– staged days after white supremacist Jeremy Christian murdered two people and critically injured a third who stood in the way of his racist tirade against two young women on a MAX train– drew a wide selection of racists, fascists, and far-right bigots into the city. The community answered, surrounding Gibson’s group on three sides and demonstrating clearly that organized hate would not be tolerated in Portland. The Portland Police Bureau then attacked anti-fascist activists with chemical weapons and explosives to facilitate the racists’ escape. MAX murderer Jeremy Christian attended Gibson’s march at Montavilla Park on April 29th, 2017, after being active in Patriot Prayer Facebook threads before hand. At the same event, Jacob Von Ott, organizer for Identity Europa, was present along with several members of the PDX Stormers. This marked the beginning of out-and-out fascists’ participation in Gibson’s events throughout 2017. The Hell Shaking Street Preachers have attended numerous rallies with Gibson, led by self-declared white nationalist Allen Puckett. 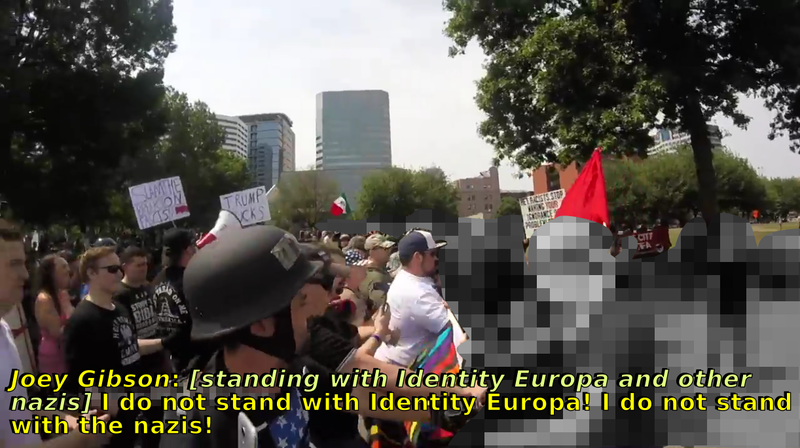 On June 4th, 2017, a crowd of Identity Europa members was present lead by Jacob Ott, as was Traditionalist Workers Party member Matthew Brian Stafford, Identity Europa representative James Allsup, True Cascadia leader Andrew Harkins, fascist bonehead Raul Gonzalez, far-right III% militia members, members of the violent, misogynist Proud Boys hate group, and many other unaffiliated racists and fascists. Anti-Semite Tim Gionet was one of Gibson’s invited speakers, and was observed reciting racist slogans with Identity Europa members and others, including teenagers. After the rally, members of the PDX Stormers and the Traditionalist Workers Party hung an anti-Semitic banner over I-205. Later that summer at rallies on August 6th, 30th, and September 10th of 2017, fascists from Identity Europa and the PDX Stormers gathered at Gibson’s rallies. Among the many other recorded nazis in attendance at these rallies were: Jacob Von Ott, Steve Shallenberger and Kip Beebe, Jarl Rockhill, Alexander Becker, and a contingent of fascists and white supremacists coming from PSU, such as Liam Wynn, Matt Duffy, Ethan Devries, Cody Bussard, and Stephen Johnston. Patriot Prayer encouraged nazis to attack anti-fascist activists at these events, side by side with their own membership and the Proud Boys. On December 9th, 2017, Gibson staged an anti-immigrant rally. There, members of the PDX Stormers, Identity Europa, and the Proud Boys attacked anti-fascist counter-protesters. Additionally, 17 year-old hopeful Hammerskins member Noah Gunn attacked a Native woman, hitting her in the face with a stick. He later bragged about this on a Hammerskins forum. It is no coincidence that Gibson is trying to come back into Portland on the anniversary of his previous defeat. As the widespread rise in far-right violence last year was met with fierce opposition from anti-fascists around the country, fascists and white nationalists have been forced into a retreat. While demoralized, they remain active. Many fascist groups have continued to grow in membership. Even now, white nationalists are planning to return to Charlottesville in August, on the anniversary of the fascist “Unite the Right” rally during which anti-fascist activist Heather Heyer was killed by a member of white nationalist group Vanguard America (since rebranded, they now operate under the name Patriot Front). After being turned away from Portland time and time again by antifascists standing strong against his racist followers, Gibson began holding events elsewhere in Washington, and has begun a contentless campaign for the position of Senator in that state. While Gibson claimed he was done with rallies and ready to focus on “serious politics”, he has apparently now forgotten his ill-fated ventures into our city, and is testing the waters in Portland once again. Despite the fact that his run for the senate has received little attention from mainstream media, his ambitions continue to to make space for fascists and other violent reactionaries to march and organize, in a transparent bid to stoke his own ego and meager celebrity. He may hope that the people of Portland have forgotten his violent carnivals of 2017, and that the community’s guard has dropped and he might be celebrated by racists once again. Joey Gibson and Patriot Prayer have short memories, but our community does not. Rose City Antifa knows now, just as we did last year: Gibson is a magnet for violent white supremacists and bigots. The time between then and now has only reinforced our resolve, and the evidence of Patriot Prayer’s racist ties has accumulated to undeniable quantities. We will not allow racists and fascists to parade through Portland’s streets, threatening activists and targeting at-risk communities. No matter how many times they try to sneak back in, this city will stand united against them. We ask the community to join us at 4:00 pm on June 3rd in Terry Schrunk Plaza, to show Patriot Prayer, just as we showed them last year, that their violence and hatred has no place in Portland.